For both my graduate literacy project and my methods inquiry project, I chose to create a "poetry club" for my seventh grade inclusion class. The idea was to introduce my students to poets of color and contemporary poets using a combination of in-class readings and an online repository in the form of a blog (http://emspoems.blogspot.com). I was able to share poems with my students on eleven separate days, and we shared a total of 17 poems in class. 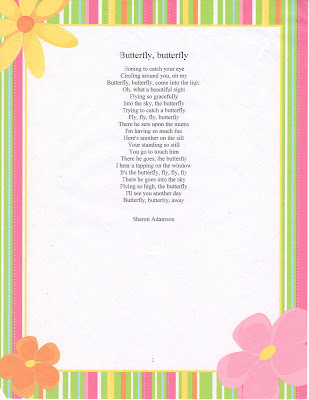 The original copy of the poem "Butterfly, Butterfly"
I am using this page to host the artifacts that I created for distribution in my class -- printable handouts of poems. Please note that all poems included in the handouts are copyrighted by the authors listed or their publishers and I am sharing my handouts for educational purposes only. With the exception of the poems on the Montage of a Dream Deferred handout, all poems are readily available online. Most poems were found on either poets.org or Poetry 180. For my last day, I handwrote Langston Hughes's poem "Dreams" and copied that page to use as notes for my students. I attached the note to a little bundle of candy and handwrote each student's name on the outside of her/his copy of the poem. The PDF of "Dreams" is attached below (under "Attachments"). Visit the Poetry Club Evaluation page to read what students had to say about the poetry club. I've also included my thoughts about the student feedback.